Drift Sublingual tincture (by Mirth Provisions) is a fast acting spray best absorbed subligualy. Instructions: Spray under tongue. Hold for 30 seconds. Feel in a few minutes. 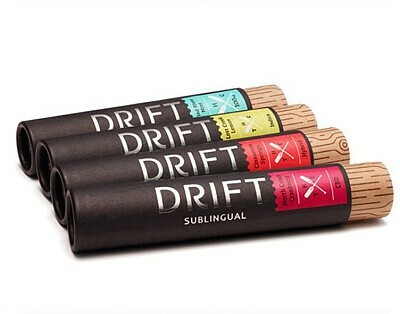 Drift reports that it is 4 times faster than average spray tinctures, 3 times more potent than average spray tinctures, exactly 1.6mg of THC per spray (for controlled dosing), and super discreet. This tincture is made with a proprietary formula from Mirth Provisions plus Rev Clinics THC distillate oil. The tincture is dispensed as an atomized mist, by the spray pump. Because of the atomization, the liquid is absorbed very quickly due to the amount of surface area under your tongue that is in contact with the atomized (tiny) molecules. 1.6mg of THC per spray | 100mg per bottle.